The complete territory of Bavaria was charted starting in the year 1808. In addition to the charting of the original tax land register, the territory of Bavaria was charted topographically and entered in so-called "Urpositionsblätter" (original position sheets) in a 1:25,000 scale. Here the complete digital copies of 902 of these Urpositionsblätter in a 1:25,000 scale are published. With only a small number of gaps, these maps represent an image of the territory of Bavaria in the early 19th century. This offer complements the 2,400 Ortsblätter (cartographic maps) of the 19th century also published by the BLO, which were drawn on the basis of these maps. All map sheets shown here are also available as reprints. For ordering please contact the Landesamt für Vermessung und Geoinformation. An Explanation for the "Urpositionsblätter" and the Topographic Atlas Sheets is available here as a pdf-document. 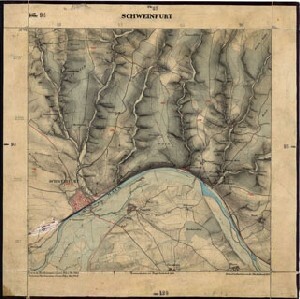 The "Urpositionsblätter der Landvermessung in Bayern" are a joint project of the Landesamt für Digitalisierung, Breitband und Vermessung and of the Digital Library of the Bayerische Staatsbibliothek within the framework of the portal Bayerische Landesbibliothek Online.